Posted January 11, 2017, in News. Surviving Poverty carefully examines the experiences of people living below the poverty level, looking in particular at the tension between social isolation and social ties among the poor. Joan Maya Mazelis draws on in-depth interviews with poor people in Philadelphia to explore how they survive and the benefits they gain by being connected to one another. Half of the study participants are members of the Kensington Welfare Rights Union, a distinctive organization that brings poor people together in the struggle to survive. The mutually supportive relationships the members create, which last for years, even decades, contrast dramatically with the experiences of participants without such affiliation. Dr. Mazelis will be giving a CURE seminar to discuss her book on Friday, February 3 at 12:15pm. The event will take place in the 3rd Floor Faculty Lounge in Armitage Hall. Download the view the full Spring 2017 CURE Seminar Series schedule here (pdf). In interviews, participants discuss their struggles and hardships, and their responses highlight the importance of cultivating relationships among people living in poverty. 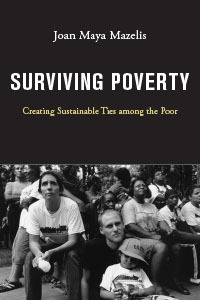 Surviving Poverty documents the ways in which social ties become beneficial and sustainable, allowing members to share their skills and resources and providing those living in similar situations a space to unite and speak collectively to the growing and deepening poverty in the United States. The study concludes that productive, sustainable ties between poor people have an enduring and valuable impact. Grounding her study in current debates about the importance of alleviating poverty, Mazelis proposes new modes of improving the lives of the poor. Surviving Poverty is invested in both structural and social change and demonstrates the power support services can have to foster relationships and build sustainable social ties for those living in poverty. Page last updated by CURE at 7:46 pm August 9, 2017 . This page was printed from http://cure.camden.rutgers.edu/2017/01/11/cure-affiliated-scholar-joan-maya-mazelis-new-book-surviving-poverty-creating-sustainable-ties-among-the-poor/ at 8:29 AM Saturday, April 20, 2019.